Start reading Enchanted Air: Two Cultures, Two Wings: A Memoir on your Kindle in under a minute. As a teacher of English learners, I see lots of connections my students can make to being bi-cultural. As a citizen of the world, the beautiful insight and the author's recall from memories were delightful. A quick and easy read I highly recommend. This is a beautifully written book that conveys the pull between cultures experienced by many children. 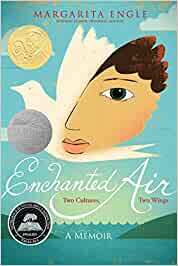 Margarita Engle's Enchanted Air tells her story in breathtaking verse, accessible for even very young readers. Highly recommended! Gorgeously written, deeply moving memoir in verse.... an engaging read for teens and adults. I read this in one sitting and learned so much!